Halo of Dark Matter - Solar System Planets And Moons Section. Astronomers have discovered a huge Halo of Dark Matter. Cassini Closes in on Titan. NASA's Cassini spacecraft will pass only 1,200 km (745 miles) above the surface of Titan today, delivering the most detailed pictures ever taken of the mysterious, methane covered moon. This image was taken on October 24, when the spacecraft was still more than 1.2 million km (745,000 miles) away, so the view is going to get much better. The photo was taken using a special filter that allows Cassini to mostly peer through the enshrouding methane atmosphere and see some of the moon's surface features, such as the bright, continent-sized Xanadu region. 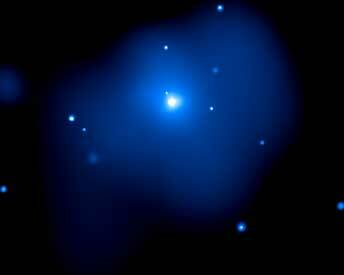 Dark Matter Halo Puzzles Astronomers. Astronomers using the Chandra X-Ray Observatory have discovered a huge Halo of Dark matter around an isolated elliptical galaxy; an object that shouldn't have such a halo, according to optical observations. The galaxy, NGC 4555, is unusual that it's a large elliptical Galaxy which isn't part of a larger cluster of galaxies. It's surrounded by a cloud of gas, twice the size of the Galaxy itself, that's been heated to 10-million-degrees Celsius. This gas could only get that hot if it was being constrained by a Halo of Dark matter ten times the mass of the stars in the galaxy. Telescopes to explore crater, stars and moon 25 - 31, 2004. September’s full moon, better known as the Harvest Moon was everything we've come to expect in the fall; a large, warmly glowing golden ball peeking above the trees just after sunset. But the splendors of several consecutive nights of beautiful moonlight can’t compare to the show the Moon will put on in late October. October offers us a chance to see a truly amazing spectacle, a total lunar eclipse on October 27/28th.